Neon stones are fashion trends for the year 2013. These fluorescent colors glow not only at daylight but also under UV black light. The best decision for the disco stars! Amazing neon rhinestone set with earrings with clips. Length of necklace 40.5 cm (16.00") and extension 5.5 cm (2.25"), earrings 6.5 cm (2.50"). Rhinestone set with clips on earrings, length 38 cm (15.00") and extension 6.5 cm (2.50"), earrings 5 cm (2.00"). 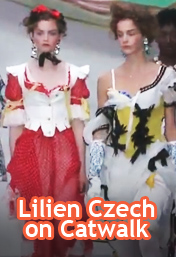 Copyright © 2006 - 2019 Lilien-Czech Jewelry.